The men’s soccer team had their fifth tied game of the season against Lehigh University (7-5-2) after a final score of 0-0. At the end of the first half, the Big Green had a chance for the one goal advantage, but Ohad Yahalom ’22 missed just wide of the goal post. Similarly at the end of overtime at the 107th minute, Dartmouth’s Jordan McNair ’19 had an open shot but missed the winning goal just wide again. On Friday, the men traveled to Columbia University (6-4-1), where they lost by a tight score of 1-0 after one period of overtime. After an erroneous header to Dartmouth’s keeper by a player from the Big Green, Columbia’s Sebastian Gunbeyi had an open shot in the 95th minute for the win. Dartmouth is now 4-5-5 going into their final weeks of the season. Dartmouth’s women’s ice hockey started the season with a tough 3-1 loss to Harvard University in Cambridge Friday night. The Big Green opened the scoring in the game with a goal by Rose Falzone ’20 in the first period, assisted by Lotti Odnoga ’22 and Sara McClanahan ’22, but were unable to respond to the two goals by the Crimson in the second period and the lone final one in the third. Dartmouth continued to pressure throughout the entirety of the game, with 26 total shots, but the team was unable to make anything connect into the Harvard goal. Despite the points, Christine Honor ’19 put on an excellent performance in goal, with 33 total saves and a .943 save percentage. The Big Green will continue away in upstate New York this upcoming weekend, as they take on Colgate University and Cornell University. The Dartmouth volleyball team fell to Harvard University in Cambridge on Friday night 3-1. The Big Green started off strong, winning the first set 25-22, but were unable to hold off the counterattack from the Crimson, who won the next three sets 19-25, 21-25, 15-25 to take the game. Despite the result, Dartmouth had strong performances from several players. Elise Petit ’21 led the team on the day, finishing with 13.5 points and 11 kills, along with one assist, three digs and two blocks. She was joined in the other categories by Zoe Leonard ’19 with 20 digs, Annemarie Horn ’22 with 16 assists and Abby Kott ’20 with five block assists. The loss dropped the Big Green to 7-11 overall, and 3-5 in Ivy League conference play, having played every other Ancient Eight team at least once this season. Dartmouth will look to try and pick up a pair of wins this upcoming Homecoming weekend, as they take on Cornell University and Columbia University at home in Hanover. The No. 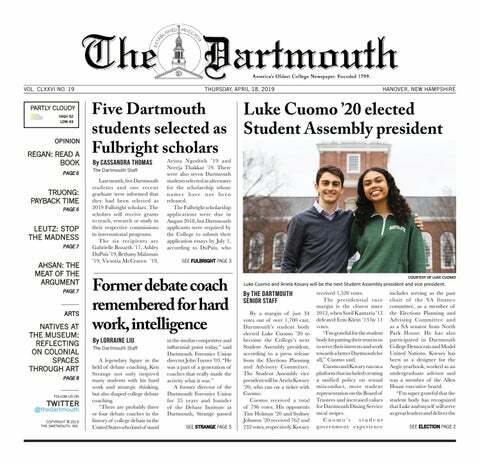 24 Dartmouth football team continued its unbeaten season Saturday with a 28-12 defeat of Columbia University in New York, putting the team at 6-0 overall and 3-0 in Ivy League conference play. The game began with a slow first half, which found the Big Green only up by one after a first quarter touchdown and a field goal from the Lions in each quarter, but Dartmouth found its footing at the halftime break. In the second half, the Big Green scored 21 unanswered points, colored only by a touchdown from Columbia in the final minutes of the game. Despite being held to a season-low 356 yards and allowing 314 from the Lions, along with having nine fewer minutes of possession overall, the Big Green were efficient with what they had. Quarterback Derek Kyler ’21 went 9-9 with 75 yards, throwing for one touchdown to Drew Estrada ’20 in the third and being on the receiving end of another from Drew Hunnicutt ’19 in the fourth. On the ground, Rashaad Cooper ’19 went for 82 yards on eight carries, garnering one touchdown in the first, while Jared Gerbino ’20 went for 42 yards. The defensive efforts for the Big Green were led by Rocco Di Leo ’19, who forced three sacks against the Columbia offensive line, and Isiah Swann ’20, who picked off two passes in the fourth to put him at seven on the season. This tally finds Swann as the national leader in interceptions and tied for the single-season record for a Dartmouth player. After defeating Columbia at their homecoming game, the Big Green will look to do the same for themselves this upcoming weekend, as the team hosts Harvard University Saturday afternoon in Memorial Stadium. Over the weekend, the women’s rowing team competed in the 54th annual Head of the Charles Regatta in Cambridge, Massachusetts. The race is the largest two-day regatta in the world, attracting around 11,000 athletes and 400,000 spectators annually. The team had a solid performance on day one, taking third in the Club 4+ out of 52 boats after a 18:56.45 finish and fourth in the Club 8+ following a 17:19.41 time. On day two, the team’s Championship 8 boat, stroked by Rhea Enzian ’21 and coxed by Grace Hannam ’21, took 20th place after a time of 18:22.41. Following a solid performance at the regatta over the past weekend, the team will conclude the fall season at the Princeton Chase next Sunday. Dartmouth equestrian beat out nine other schools on Saturday to win the Colby Sawyer show, putting the team back ahead of the University of Vermont with the regional points lead. The performances on the day were led by Sabrina Jain ’22, who took first in Novice Flat and third in Intermediate Fences, giving her the Reserve High-Point Rider spot in the show. She was joined by Margot Putnam ’19 and Elizabeth Carroll ’19, who took first in Walk Trot and Beginner Walk Trot Canter, respectively, and Olivia Champ, ‘19, who finished second in Open Fences and Open Flat. The Big Green will look to strengthen its regional lead this upcoming Saturday, as it heads downstate to Durham for the University of New Hampshire show. At Friday’s Central Connecticut State University’s mini meet at Stanley Quarter Park, the team finished in seventh out of 12 teams with 166 total points. Liam Jamieson ’22’s 10th place finish in the 5k with a time of 15:15.7 led the charge for the team. Providence College secured first place with 29 points. The men are preparing for the Ivy League Heptagonal Championship next Saturday, October 27. The men’s team is looking strong across the board as they prepare to go head to head with other Ivy League runners in Princeton. The women’s cross country team recorded 123 points at the Central Connecticut State University 3k course this weekend to place fifth overall. Breanna Glover ’22 finished in sixth (10:17.2) and Rachel Ludwikowski ’21 (10:19.3) finished two places behind to represent Dartmouth in the top ten competitors. The Big Green fell to Providence College (20), Boston College (78), New Hampshire (86) and Central Connecticut State (99) to give the team an overall finish of fifth place. Veronica Winham ’22 (10:56.6), Soleil Gaylord ’22 (11:03.5) and Madaket Nobili ’22 (11:05.6) finished in the top 41. This young group will pose a serious threat to the Ive League schools at this weekend’s Ivy League Heptagonal Cross Country Championship at Princeton. Dartmouth field hockey took down Columbia University 2-1 Friday in New York City, and followed with a 2-1 win against the University of Massachusetts Lowell Sunday afternoon, putting their record on the season at 6-8 overall and 2-3 in Ivy League conference play. The goals against the Lions were led offensively by Tatum Schultz ’21, who found the net in the 44th minute, and Jessica Valvano ’19, who scored in the eighth minute for her first career goal. Defensively, Hailey Valerio ’19 led the team with five saves, including a nabbed penalty shot in the final minutes. The win gave head coach Amy Fowler, already the most victorious coach in Dartmouth history, her 150th victory of her career. On Sunday, the Big Green defeated the River Hawks 2-1 in a hard-fought match. While UMass Lowell raced off to a 1-0 lead right after the half, the Big Green scored two goals later in the half to clinch the win. Dartmouth’s aggressive offensive generated more opportunities than the opposing team, as they recorded 10 shots on goal versus half as many for the River Hawks. Over the weekend, the men’s golf team competed in the Camden Collegiate Invitational in Camden, South Carolina, tying for seventh out of nine participating teams. In the first two rounds on Saturday, the team finished in last place after a score of 30-over 590. John Lazor ’19 led the team in a tie for 16th after carding a 73-72-145 (+5).The team had a stronger performance the next day, with Jason Liu ’20 leading the way with a 1-over 71 carding. Following the third round, the team’s final score of 887 (+47) boosted them up two places to finish the tournament in seventh place. The tournament marked the end of men golf’s fall season. Over the weekend, the sailing team competed in three major races, including the Fiske-Harriman-Sleigh Trophy Coed Showcase at St. Mary’s College, Yale’s Women’s Regatta at Yale University, and the Oberg Trophy at Northeastern University. At the Coed Showcase hosted by St. Mary, the Big Green took 13th out of 18 competing teams after tallying 346 points. At the Yale Women’s Regatta, Dartmouth took sixth out of 14 teams with a final score of 128. The racers faced strong gusts that peaked into the 30’s on Sunday. In the Oberg Trophy, the team took 10th out of 20 competing teams, finishing with a total of 368 points. The University of Rhode Island finished in first with 161 points. Earlier this week, the men’s tennis team finished strong at the Intercollegiate Tennis Association Northeast Regional Championship in Princeton, NJ. Charlie Broom ’20 took down Cornell’s Lev Kazakov in three sets to advance to Tuesday’s semifinals. Broom then defeated Columbia’s Jack Mingjie Lin in 2 sets (6-4, 6-3) to advance, but lost in the finals to Cornell’s David Volfson (7-5, 6-3). However, Broom’s semifinal win earned him a spot in the ITA National Fall Championship in November, making him the first player from Dartmouth to have competed at fall nationals since 2015. The men’s tennis team hosted the Dartmouth Invitational from Friday to Sunday. Sid Chari ’22 advanced to the semifinal but lost to Harvard’s Harris Walker with scores of 7-5, 7-6 on Saturday. John Speicher ’21 and Roko Glasnovic ’19 similarly fell short of the final with a 6-0, 6-3 loss to Yale and 6-3, 6-1 loss to Buffalo, respectively. John Speicher ’21 and Pierce Widdecombe ’22 won the semifinal match against Yale, but fell to Buffalo’s double pair 8-2. Dartmouth duo Chari and Pritzker took down two Boston University double teams in consolation games. On the final day of the tournament, five different Big Green players won matches over the course of the day. Gilbert Jaeger ’21 won his flight, defeating Buffalo 6-3, 0-6, 6-4 in the Flight B Final. In two weeks, the men’s tennis team will travel to Minneapolis for the Gopher Invitational.